I was all set to write-up my thoughts on dining at Bareburger a few weeks ago but something inside me said go one more time before offering a proper review. Had I written this review after my first dining experience at Bareburger, I would have been all like, YOU MUST GO! IT’S SO GOOD!, but then I went again a few days ago and had a not so great experience. Bareburger recently opened in my area (for local readers, Bareburger opened in Plainview, right in between the two Plainview shopping centers). If you check out their website, you will see that Bareburger has locations around the world with a concentration in New York and other East Coast areas although I do see locations in Ohio and California listed on the map too. Bareburger prides themselves on their organic, free range, pesticide-free, non-GMO menu with a sensitivity to food allergies. They label their menu really well so those looking out for Vegan, Gluten-Free, Nut-Free and Shellfish are aware of what they are ordering. 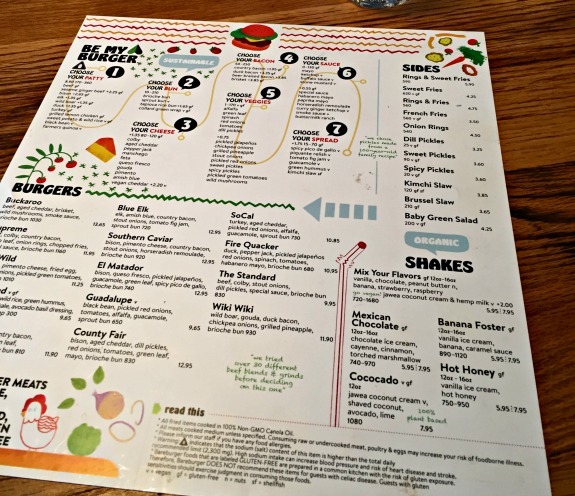 One side of the big Bareburger menu displays salads, shares, and sandwiches. 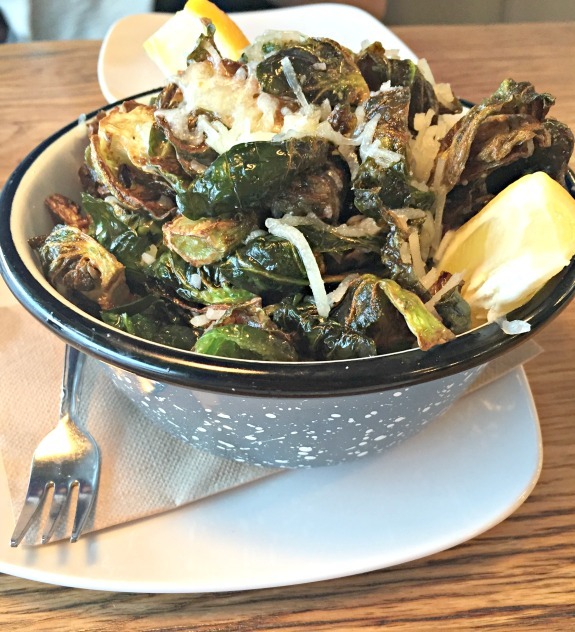 We ordered the crispy brussels sprouts as our appetizer during our first visit which were out of this world. I have ordered crispy brussels sprouts in various restaurants in the past but I am pretty sure that these were my favorite. 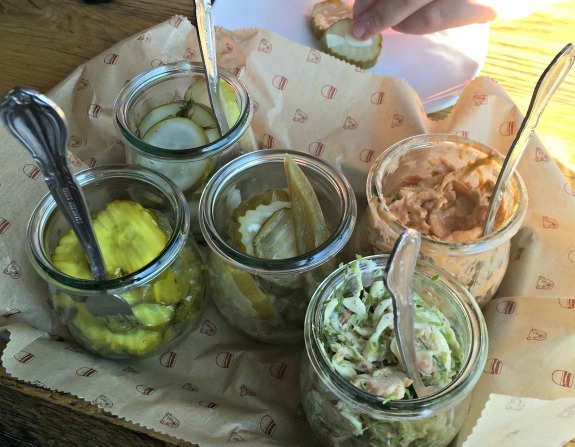 In an effort to try something different during my next visit to Bareburger, we ordered the pickles and slaws as our appetizer. It was a pricey appetizer for what it was and I can’t say we loved it. It was just okay and not something we would order again, even as pickle lovers. The coleslaws were cool and different in concept, a kimchi slaw and a brussels slaw, but nothing overly special in taste. I would have preferred the crispy brussels sprouts and I was unimpressed when the pickles and slaws arrived for almost $12 in price. 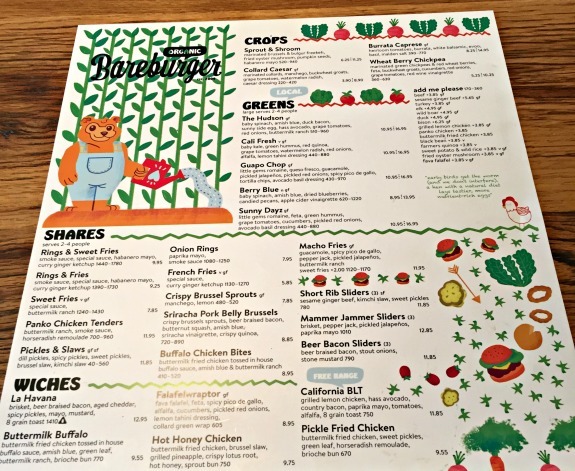 I reviewed the Bareburger menu before going to ensure that I would have something to eat since I don’t eat meat. They have three veggie burger options which you can have on top of a salad or build as a burger. They also have falafel. At my first visit, I ordered the black bean burger. You are able to customize your burger or choose from their signature combinations. I went with the customize option. I chose the collard green wrap option instead of a bun along with sprouts, tomatoes, sweet pickles, sautéed mushrooms and guacamole on the side. I really liked the black bean burger and the way they serve it on a skewer is cute. I made sure to try another veggie burger option during my second visit so I went with the farmers quinoa burger. I did not love it at all but I am not sure as to why. It’s hard for me to find a “veggie burger” that’s bad but there was something annoying to me about the taste of this quinoa burger. In fact, had I not been hungry, I may not have finished it. I ordered the farmers quinoa burger with tomatoes, sautéed onions and mushrooms and sprouts. They forgot the sautéed onions so when I mentioned this to the waitress, she told me she would bring them to me on the side but never did. 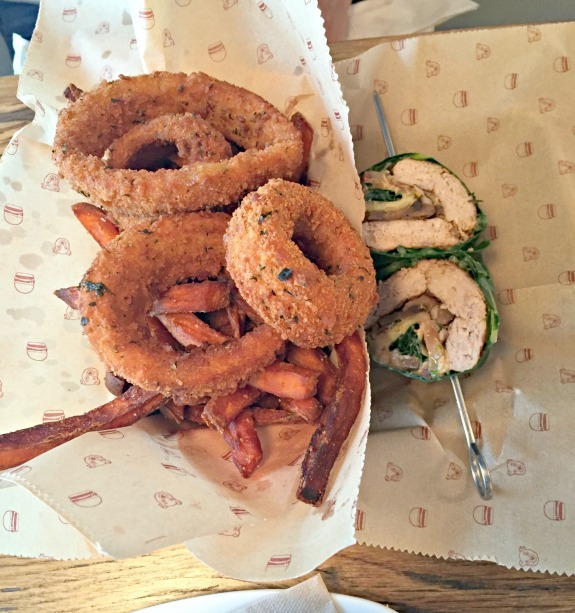 Both times that I went, we ordered the onion rings and sweet potato fries side option. Their onion rings are terrific. The only problem with the sweet potato fries is that my son had actually asked for regular French fries during our second visit but they brought him the sweet potato fries instead. Bareburger also serves shakes from a small shakes menu but we didn’t try those. From what I understand, the burgers and other sandwich options are really good. My friend liked what she had (which is the chicken sandwich in the above photo) and I think my son liked the burger he ordered (but he was also busy complaining that everything was “healthy” so we can’t exactly go by him). Would I go back to Bareburger? I don’t know. I probably would for the crispy brussels sprouts but my last visit really turned me off. The service was horrendous which didn’t help the fact that I didn’t like what I ordered. I think that terrible service tends to stand out and keep me away from dining at certain restaurants. The waitress was so super nice the first time we went but last week, the service was simply terrible. Maybe this waitress was having a bad day, maybe she was new but even so, the rest of the staff seemed dazed and out of it. We waited way too long for water, for our food, for the onions that never arrived, and for our check. 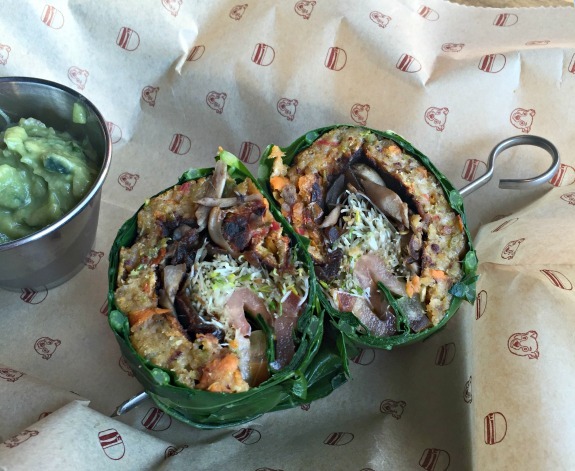 Do I think it’s worth you trying Bareburger in your area? I do. Aside from the service, I do think there is a ton of variety on the menu and it’s nice to know that the quality of the food and attention to allergies is on target for what we desire. 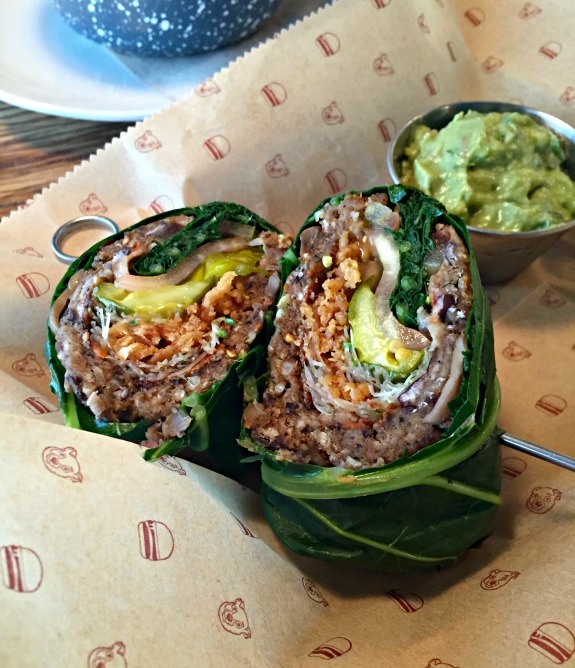 Have you been to Bareburger? What do you normally order? Does bad service keep you from going back to certain restaurants? Why are my weekend recaps mostly about food? If we have bad service we will maybe go back one more time to give it another chance. I don’t think there is a Bareburger around here. It sounds like something I would like although it would drive me crazy if I wanted a certain side and never got it! We tried Barburger on the upper east side and I was soooo disappointed and under welled!!!! The food came all wrong. The sweet potatoe fries were cold and the smallest portion–we ordered the portion for two. The description of dazed service is completely appropriate to our experience also. Mine came without some of my requested topping also. I told the waitress and she also never brought them. The Brussels did rock–they were the best part of the experience, but it is hard to ruin those. I was annoyed by the end of the meal because I go out to eat to enjoy something tasty I don’t have to cook, relax and have fun. I was so annoyed I told the manger and he took the sweets and one meal off the bill. He said “oh yeah this happens often I will take it off the bill.” I said, I would rather have paid and enjoy my food and he looked at me dazed. I went back a second time months later to have a similar experience so I would say it’s a commercial establishment, run by non-owners who just don’t have interest or really give thought to providing customers with a good dinning experience. It’s off my list for good. We don’t have a Bareburger out here but it’s the type of place that I would try. We do have an organic grassfed burger place called BurgerMaster right by our apartment but their food tastes just okay so we don’t go there now. Good service is important – eating out is expensive and poor service makes me wish we had just stayed home. I know! I was so annoyed! It really ruined the experience. I loved it the first time I went though so maybe ill go back and try one more time. I’ve never been to a Bareburger because I’m pretty sure we don’t have one up here, but you know I love the fact that they have allergy-friendly meatless options 😀 The service thing is kind of a bummer, though. Maybe it was just an off day for them? yes, you would appreciate their menu! Oh wow, everything looks so dreamy! Those brussel sprouts look to die for. It’s unfortunate when the service is horrible but the food is great. It makes you unsure if you want to go back, despite the delicious food! the brussels sprouts were terrific for sure. It seems like service can always vary day by day, but it sounds like the food was A-AMAZING! 🙂 I love your honest review, and hopefully someday, we’ll have one in Colorado. Or maybe I’ll just have to come out your way and we can go. yes! totally plan a trip to new York! I like Bareburger because it’s so easy to get exactly what I want and I like the creative burger types. Usually I’m a turkey burger fan but I really like the duck burger. And I appreciate the fries all being GF which is not often true. BUT both in the NYC location we go to and the one in Connecticut, it is pretty pricey when you consider the typical burger and fries combo at a diner or burger place. I consider it worth it because of the GF peace of mind but otherwise wouldn’t if that makes sense. There is one down the block from me in Bayside and must be a thing because it is the service that turns me off the most. And, they always mess up my order some how. I think it is too overpriced to deal with both those aspects. I did make the mistake of getting it delivered once and that was a bad choice as well!